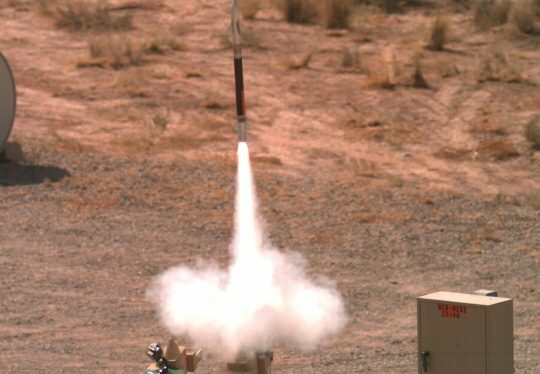 WHITE SANDS MISSILE RANGE, N.M., Aug. 2, 2016 –Lockheed Martin’s Miniature Hit-to-Kill (MHTK) interceptor was successfully launched in an engineering demonstration at White Sands Missile Range, New Mexico. The demonstration on Friday, July 29, was part of the U.S. Army’s Aviation and Missile Research Development and Engineering Center’s (AMRDEC) Extended Area Protection and Survivability (EAPS) program. The flight demonstrated the agility and aerodynamic capability of the MHTK missile, which is designed to defeat rocket, artillery and mortar (RAM) targets at ranges greatly exceeding those of current and interim systems. Today’s test advances the program, increasing the level of MHTK maturity. The MHTK interceptor is less than 2.5 feet (72 cm) in length and weighs about 5 pounds (2.2 kg) at launch. It is designed to be small in size while retaining the range and lethality desired in a counter-RAM solution, with the reliability of other Lockheed Martin Hit-to-Kill interceptors. The MHTK uses Hit-to-Kill technology, which destroys threats through kinetic energy in body-to-body contact. Hit-to-Kill technology delivers all of the available interceptor energy, but removes the risk of collateral damage seen in traditional blast-fragmentation interceptors. The MHTK interceptor complements other Lockheed Martin Hit-to-Kill missile interceptors by delivering close-range lethality with proven success for a true layered Hit-to-Kill defense. As a world leader in systems integration and development of air and missile defense systems and technologies, Lockheed Martin delivers high-quality missile defense solutions that protect citizens, critical assets and deployed forces from current and future threats. The company’s experience spans missile design and production, infrared seekers, command and control/battle management, and communications, precision pointing and tracking optics, radar and signal processing, as well as threat-representative targets for missile defense tests.